Western readers unfortunately were only given abbreviated and redacted versions of the original news story, “Manufacturing” Abandoned Infants", that appeared July 1, 2009 in the Guangdong Newspaper "Southern Metropolis News". Research-China.Org has decided to present an English translation for interested readers. One will find the original story more detailed and compelling than later recountings. What strikes the reader of this story is the general feeling of hopelessness on the part of the birth parents. Years of abuse by the local government have left them largely numb and unfeeling, displaying not "any sign of obvious gladness or grief, just a common sigh for their destiny." As the New York Times described it, villages and towns are often "private fiefdoms run by local party officials." These corrupt officials (and they are corrupt) "effectively choke off information to Beijing, blinding the central authorities as to exactly how their mandates are carried out." Most families abused like those in Zhenyuan quietly go on with their lives, hating their local officials but feeling incapable of seeking redress from officials that largely protect each other and courts influenced and controlled by the same government. But yearly tens of thousands of "rebellions" occur in China's villages, many of them a result of vicious Family Planning actions. Other families seek peaceful resolutions, as the Gaoping families in Hunan did when they filed a civil lawsuit against local Family Planning officials after eleven children were confiscated and adopted internationally through the Shaoyang orphanage. While the Chinese government seeks to pacify international governments that such stories are rare, in fact any Baidu search will discover hundreds of similar stories of Family Planning abuses. Sometimes one can correlate such "campaigns" with increases in abandonments, as was demonstrated in Zhenyuan. In Huazhou, Guangdong Province, for example, is found Wenlou Town. Prior to January 2004, only one child was found in this area since 2000. Beginning January 2004, thirty-six children were found in this town. Findings ended in November 2004, and no children has been found there since. Not coincidentally, in June 2005 Family Planning officials in Wenlou Town were given an accommodation for their "success" the previous year (“Maoming Daily” newspaper, June 25, 2005). A similar pattern is seen in Yueyang County, Hunan, to take another example gleaned from our Birth Parent Search reports. 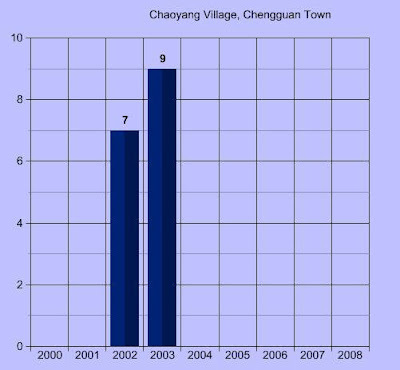 Between April 2002 and April 2003, sixteen children were "found" in Chaoyang Village. With one exception, all of the children were over a half-month old, and almost all were one or two months old when found. This is extremely rare in random findings, but extremely common when Family Planning officials work in an area (most legitimate abandonments occur when the child is less than a week old). One can discover similar patterns in nearly every orphanage in China. Zhenyuan offers us a glimpse behind the abandonment statements to the birth families sometimes impacted by the international adoption program. Qin Keqin, one of the father's who child was taken by Family Planning in Zhenyuan, lamented: “Previously it was very easy to apply for registered permanent residence for an abandoned infant, but now it’s not easy any more. All abandoned infants are sent to the orphanage by the Family Planning office." It seems pointless to point out that without the international adoption program, there would be little incentive to confiscate children. One final point: I had nothing to do with the distribution of the photo of the Dutch child, and find the discussion of blame in that situation distracting from the real story -- that of the origin of Zhenyuan's adopted children. I also did not supply the finding ads used by the reporters. These were collected from families who had adopted from Zhenyuan. Given that orphanage's problems, it is ironic that they gave families the evidence necessary to find the story themselves. ■ Investigation of the journalists proves that the impoverishment and numbness of the parents were also one of the reasons that caused this strange phenomenon. Knife scars around his neck and chest show that Lu Xiande is a human tragedy. He once tried to commit suicide. These knife scars are his special commemoration for his fourth daughter. As parents, neither Lu Xiande nor his wife remembers the birthday of this daughter, only knowing that she was born in December 2003 in the lunar calendar. In May 2004 in the lunar calendar, she was taken to the orphanage by force by local family planning personnel [the girl's finding ad gives the date as June 8, 2004 at “Jiaoxi Town, Tianxi Village, Lu Xian De Home”]. There has been no news about her since then; she was still not even named. Jiang Wen (anonym) is a relative of Lu Xiande and he has been in Guangdong province for 10 years. When he went back to his hometown in 2008, he learned that among his relatives, besides the daughter of Lu Xiande, two other over-quota daughters separately by Li Zeji and Luo Xingbin were also taken to the orphanage by local family planning personnel. The family planning personnel claimed that the government would raise these children for them. Actually, these children’s whereabouts are unknown. But for many years, these parents didn’t search for their children. Jiang Wen heaved a sigh at the numbness of these families, just as Lu Xun sighed on kind of Run Tu. Since January 2009, Jiang Wen posted many messages searching for these children. With the investigation of overseas web friends and journalists, a secret in Zhenyuan County, Guizhou Province that had been hidden for many years, has gradually emerged. This dialogue, existing in the memories of the two parties, happened on a sunny afternoon in June 2004. It was between Shi Guangying, a family planning official of Jiaoxi town in Zhenyuan county, and Yang Shuiying, the wife of Lu Xiande, who lives in Yangba group, Tianxi village, Jiaoxi town. According to the policy, Lu Xiande can only have two children. He wanted a boy, who finally arrived after three daughters. When the boy was more than 1 years old, Lu Xiande had a vasectomy. But Yang Shuiying found she was two months pregnant. “I had to give birth to her since I was pregnant already. Abortion needs money. Now that she was born, I can’t kill her.” Said Yang Shuiying. With this simple and inornate mind, she gave birth to the fourth daughter. Lu Xiande’s home is located in a high mountain, with a group of hills extending around, where the traffic is quite inconvenient. And there are only about five families living in the village. Acquisition of outside information is as difficult as the spreading of inside information. Therefore, although birth control policy was enforced very strictly, this daughter still lived half year within her family. Yang Shuiying carried her on her back while laboring. It’s quite common to abandon infants or send them to others in mountain areas where people are afraid of fines and treat woman as inferior to men. But Lu Xiande did neither of this though they had three over-quota children. Jiang Wen hadn’t been back home for 10 years before July 2008, so he only remembered that Lu Xiande loved his eldest daughter very much. “He was very nice to his eldest daughter. Children of other families ate breast milk only, but he fed her white sugar and egg mix. He often held her in his arms to kiss her,” said Jiang Wen. Now the annual income of the whole family is less than 5000 Yuan ($735). But all four children, whether boy or girl, go to school. As to the two daughters who have registered permanent residence, Lu Xiande said he would support their studies as long as they were willing to study. This information is to show that Lu Xiande doesn’t treat woman as inferior to men. If the fourth daughter hadn’t been taken away, she would now be almost at school age. But unfortunately, one day in June 2004, Yang Shuiying was approached by Shi Guangying when she was herding cattle on the hillside with this daughter on her back. “The first time, I came from the side and she was herding cattle. I saw the baby on her back, and a towel on her head. The baby was very young, while her son was old enough. The second time I went to her home and she was taking meal.” said Shi Guangying. Only Yang Shuiying herself was at home on that day. Five years later, on June 19 2009, Yang Shuiying recalled that Shi Guangying said he would take away the child and that this would offset the fines. Shi Guangying, at age of 54, has a son and grandson already. His grandson goes to school in Dongguan city. He misses his grandson very much. He has normal humanity and sensibility. “In fact, if she begged the government not to take away her child, and said she would borrow money from relatives, then we wouldn’t have taken the child away. But she was too honest. Her family is the poorest in that group. It’s also very difficult for us to conduct our work,” said Shi Guangying. “I have no other way. I don’t have money to pay the fines. They promised not to ask for fines any more,” answered Yang Shuiying. The baby was sleeping deeply and sweetly without seeing the tears in the eyes of her mother, who was besieged by a group of strange men. But her mother held her designedly and had a careful look at her. From then on, the girl left her mother’s arms forever, leaving her mother to only meet her again in her dreams. The officials of Jiaoxi town arranged for her to have vasectomy operation after she was back to the town, although her husband Lu Xiande had already had the operation. Lu Xiande brought her home after the third day. Upon knowing that his daughter was taken away, Lu Xiande said calmly “The policy has stipulations. We have no other way.” This was to comfort Yang Shuiying, but also himself. Actually, he responded similarly to Lu Xiande upon knowing that his daughter was taken away by family planning personnel. Li Zeji lives in Lanqiao group, Tianxi village, Jiaoxi town. His wife gave birth to a female infant spontaneously on March 18, 2004 in the lunar calendar, when he had two daughters already. In order to have a son, they went to Zhejiang Province to work, taking the two daughters with them and leaving the one-month old daughter with his cousin. Two years later, Li Zeji and his wife finally got a son after giving birth to another daughter in Zhejiang, and then went back to their hometown. Only at that time did they know that the girl fostered by the cousin had been taken away by local government already. “We didn’t dare to ask the government since the daughter was over-quota and we will be fined. We didn’t search for her either afterwards,” said Li Zeji on June 19. It seems that having a son is the greatest achievement of their lives. Abandoning a daughter seems to be the cost they should pay to get a son. Yang Zaiqing’s wife, who lives in Xinzhai village, Duping town, Zhenyuan county, gave birth to their third daughter in 2003, when their eldest daughter had already died of cardiopathy and lymphoma. According to the policy the third daughter was not over-quota. But in order to have a son in the future, Yang Zaiqing asked the family planning personnel of Duping town to inform the Zhenyuan county orphanage to take away his third daughter. He has never thought to call on this lost daughter for 6 years because there was “no time”. Foreign adopters donate $3,000 to the orphanage for each infant adopted. Jiang Wen was shocked at the cruel reality of what happened with his relatives in his hometown. Jiang Wen started searching on web for the children in January 2009. An American researcher named Brian Stuy, who has adopted three children from China, and has a Chinese wife, soon saw his post. Mr. Stuy forwarded the post to an American woman named Windy and a Chinese student studying in America named Hu Ying (pronunciation). Hu Ying and Windy are good friends and Windy has adopted a Chinese girl named “Gu Chenghui”. Hu Ying, from Hangzhou, China, often helps American families with adopted children from China with translation. Hu Ying forwarded the investigation of Brian Stuy to Windy. The investigation showed: America and some European countries have adopted many female infants from the Zhenyuan County orphanage -- specifically, 24 infants in 2004, and 11 in 2005. There were no record in 2006, because in November 2005, the police of Qidong County Hunan province, while solving an infant gang case, found that the instigators behind the scene were several orphanages in Hengyang City. These human traffickers colluded with the orphanages and sent hundreds of infants to overseas adoption channels. The orphanages received $3,000 in donations for each infant. This case aroused great dispute during the trial in 2006. In 2007, another 6 female infants from Zhenyuan County orphanage were adopted by foreigners. Their adoption procedure is completely legal. The adoptive families submitted an adoption application through a foreign agency to the China Centre of Adoption Affairs (CCAA), while the Zhenyuan County orphanage provided the orphan information to the CCAA, who will audit and make matches. The CCAA, entrusted by the Chinese government, is mainly responsible for foreign adoption affairs. Foreign adopters gave the Zhenyuan county orphanage $3,000 as a donation for each infant they adopted, while the China side provided all related materials of the infant to the adopters, including orphan certification materials. According to the stipulations of the "Adoption Law of the People’s Republic of China", orphans under the age of 14 and bereaved of parents, abandoned infants or children whose parents cannot be ascertained or found, and children whose parents are unable to rear them due to unusual difficulties, may be adopted. The law also stipulates that when an abandoned infant or child whose biological parents cannot be ascertained or found is adopted, the Civil Affairs department in charge of registration shall make an announcement prior to the registration. Lu Xiande, Li Zeji, and the others didn’t find any clue of this announcement. The girl adopted by this Dutch mother was named “Gu Chengjun”. She was picked up in the corridor of the Family Planning office of Yangchang town, Zhenyuan county. The announcement shows that five of the fourteen female infants were separately picked up in public places such as a Family Planning Office, a bus stop, along the roadside, a road intersection, etc, while the other children were all picked up at the gate of a villager’s house. This announcement shows: Gu Chengqian, abandoned at the gate of Lu Xiande, Tianxi village, Jiaoxi town, Zhenyuan county; Gu Chengjuan, abandoned at the gate of Peng Hongde, villager of Putian Village, Qingxi town; Gu Chengyong, abandoned at the gate of Fu Kaijin (husband of Xu Linzhen), villager of Da Di Shi village, Da Di town; Gu Chengwen abandoned at the gate of Li Daiwu (cousin of Li Zeji), villager of Chexi village, Jiaoxi town, etc. Actually, no infant was ever found at the gate of these families. Though many years passed, Peng Hongde and Xu Linzhen, etc., can still exactly confirm that the children in the photos are the children taken away from their home by force. Li Zeji and Lu Xiande can’t identify their children because the children were too young when taken away, and because so many years passed. Evidence from many ways proves that these children, taken away from their own parents or foster parents by force, are “manufactured” as infants by the Zhenyuan county orphanage. “According to our investigation, it is true that babies who have parents were forced into the orphanage and then abroad,” Tang Jian, leader of the Disciplinary Inspection Group of Zhenyuan Administration of Birth Control, was quoted by this newspaper. False abandoned infants are quite common in the Zhenyuan area. The families all claim that their children were picked up somewhere in order not to be fined. Peng Hongde “picked up” a female infant in 2003. On August 16, 2003, more than ten people from the Jiaoxi Town Government took away the infant from Peng’s wife. Peng and his wife struggled to stop them, but they were taken to the police, locked up in the cell, and fined 50 Yuan ($7.30), accused of abusing the officials. At that time the officials of the Town Government went to his home to tell him that the girl was very pretty and he could adopt her if he could pay 3000 yuan ($441). But at that time he couldn’t even afford 300 Yuan ($44). His family only has a little farmland, and his wife sells rice bean curd (a kind of local nosh) at the country market when it opens. About 20 days later, Peng Hongde went to the Zhenyuan county orphanage to look for the infant. The welfare house refused to tell him the whereabouts of the infant, only telling him that the infant had been sent outside and was being fostered by an aunt. On June 19, 2009, Peng Hongde confessed that the female infant was over-quota by his relative, who is afraid of fines. “If she couldn’t pay the fines, her house would be broken up or the infant would be taken away.” So the relative gave the infant to him. But from the beginning to the end Peng refused to disclose the name and address of the infant’s own parents. Such phenomenon of falsely abandoned infants is quite common in Zhenyuan county. The cousin of Li Zeji and the elder sister of Luo Xingbin both claim that the children were not their own due to fear of fines when family planning personnel took away their two over-quota daughters. This is the only exception since all the other abandoned infants, or infants who were sent to others, were all female infants. In the mountain area, the value of a boy is more than simply carrying on the family line. Lu Xiande is the eldest son in his family and has two younger sisters and one younger brother. His father died on the lunar New Year evening in 1989, when he was in third grade in junior middle school. At that time he studied very well, especially good at calligraphy and painting, and he was responsible for the blackboard news in his class. But according to local custom the eldest son must undertake the family after the father’s death. So Lu Xiande stopped schooling and went back home .Although his teacher had tried to persuade his mother, still he became a farmer from that point on. At that time his mother wanted to remarry but she finally stayed due to Lu Xiande’s decision to stop going to school and through the persuasion of the elders of the clan. Now, though more than 20 years have passed, the meaning of a boy to a farmer’s family still hasn’t changed much. There are a total of twelve towns in Zhenyuan county, and all are located in the mountain area. Terraces cut in order, reflecting the green mountains and the white clouds in a blue sky, can be seen everywhere. Those yellow dry land patches and green terraces cut in different shapes, when seen from the mountain top, are interlaced with each other just like colorful baldaquin. However, the beautiful scene in the visitor’s eyes means heavy labor to the farmers living there. Chopping wood, ploughing land and applying fertilizer, etc, all need to be done by men. This is the main reason why each family is eager for a boy. Therefore, large sum of fines are imposed for overbearing, which induces many genuine or false abandoned infants. If you inquire in the towns of Zhenyuan county randomly, you will hear the stories of finding abandoned infants almost everywhere. A low-level official, who once worked in the Family Planning office of some town in Zhenyuan county in 2003, said that in certain years the birth control policy was enforced very strictly, so there were abandoned female infants often. He picked up about four female infants during his term. All these infants were given to local infertile villagers through the Civil Affairs authority. 16 years ago, Qin Keqin (anonym) in Jianggu town, picked up an abandoned female infant. At that time villagers often abandoned the female infants on the street, because residents near the street are richer than in mountain areas. Qin Keqin lives on a street near the town government. At that time he had two sons already. When his wife took the female infant to apply for registered permanent residence, the family planning office refused. His wife then said she would give up the infant and leave her with the Family Planning office. Then they had to comprise. Now the infant has grown into a pretty girl, and has just attended entrance exams to senior high school. “Previously it was very easy to apply for registered permanent residence for an abandoned infant, but now it’s not easy any more. All abandoned infants are sent to the orphanage by the Family Planning office,” said Qin Keqin. The hard life leaves no time for the poor parents such as Li Zeji and Lu Xiande, etc. to miss their lost daughters. The phenomenon of genuine or false abandoned infants taken by force to the orphanage is so common that local people have already gotten used to it. In addition, abandoning infants and sending children to others happens frequently. All this leads to a terribly contorted understanding by the farmers towards life and ethics. Therefore, there was no ardent conflict when the government took away the over-quota daughter by force from Yang Shuiying. Lu Xiande even considers this as a stipulation of the policy. Jiang Wen’s mother, who had been in charge of the family all along, died when Jiang Wen was in his second year at the university. According to local custom, he should also go back home to look after his younger brother and sister. But he didn’t. He didn’t ask for any money from his family since then, absolutely living on his endeavor and the support of his girlfriend to finish his studies. Now he and his wife own a training centre and a company that sells air cleaning equipment. Jiang Wen, through phone calls with his family in recent years, learned that Lu Xiande had greatly changed. With little farmland and many children after marriage, they don’t have enough food to eat. The conflict between Lu Xiande and his mother gets deeper as time goes by. Lu Xiande went insane after 2005. He often shouts very loudly and chops at others with a knife. Lu Xiande went out for a job for the first time in his life after his daughter was taken to the orphanage by force in 2004. However, in the “Gold is Everywhere” Guangdong province, he couldn’t even earn his traveling expenses and had to borrow money to go home. He cut his own neck with a pig killing knife and cut out his heart at his aunt’s home one day in 2005. His aunt discovered this in time to save his life. “I can’t think of anything else. My daughter is lost and my family is so poor. I feel myself a futile sort of person and dreg of society.” Lu Xiande said this on June 19, 2009, while a hen is foraging around his feet with several chickens. His family breeds about 30 chickens, 30 ducks and 5 pigs, besides around 5 mu (0.4 hectares) farmland. The total annual income is less than 5000 Yuan ($735). And the four children’s studies cost 2000 Yuan ($294) every year. They all have lunch at school. In order to increase family income, Lu Xiande went to the blood plasma station of Zhenyuan county to sell blood all the year round from 2002 to 2005. Each month he sold seven or eight times and each time got paid 80 Yuan ($11.80). Afterwards the head of blood plasma station of Zhenyuan county was sentenced to life imprisonment because of the embezzlement of 9,600,000 yuan ($1,411,765) of state property and only then did Lu Xiande stop selling blood. Now two of the four children still don’t have registered permanent residence because it involves 12,880 Yuan ($1894) in fines. Lu Xiande knows that the children can’t go to middle school without registered permanent residence. So he plans to let the two children quit school after graduation from primary school due to his inability to pay the fines. Only one child of the four children of Li Zeji has registered permanent residence. The family planning personnel asked 40,000 Yuan ($5882) as fines, which decreased to 5,000 Yuan ($735) after bargaining. But Li Zeji still can’t afford it and only borrowed 1,000 Yuan ($147) to pay to the family planning personnel. He could earn 1,000 Yuan ($147) per month when he was in Zhejiang province. His salary needs to support his wife, four children and himself. But he still considers that life there is better than in his hometown. But they had to go back as the children needed to go to school. Now they only have 2 mu (0.1 hectares) farmland for 6 people. Li Zeji does some odd jobs near his home with a salary of 50 to 60 Yuan ($7 to 8) per day and his wife breeds several pigs at home. Tiring labor, hard life and a heavy burden leave no time for Li Zeji and Lu Xiande, etc. to think about the whereabouts of their lost daughters. How many “abandoned infants” named Gu Cheng? 78 of 80 abandoned infants, all named Gu Cheng (such as Gu Chenghui, Gu Chengqian, etc. ), have been adopted by American or European families. The registration material of the infants adopted by foreign countries show that there were a total of 80 abandoned infants in the orphanage since 2001. Excepting two handicapped girls, the other seventy-eight children were all adopted by families in America, Belgium, and Spain, etc. It’s unknown how many children among the infants have the same destiny as the fourth daughter of Yang Shuiying. But the memory of Shi Guangying, who was once head of family planning office of Jiaoxi town, is of great value. When her fourth daughter was taken away, Yang Shuiying asked Shi Guangying, “Why didn’t you come when I was pregnant?” Shi Guangying answered that they didn’t know when she was pregnant. If they had known, her other two over-quota children would also have been taken away, but at that time they were too old to be taken away. Later because there were so many infants in the orphanage that they infected each other and caused disease, the Zhenyuan orphanage employed some aunts, whose salary was 300 to 400 Yuan per month ($44 to $58), to raise the infants at home until they were adopted by a foreign family. “Sending them abroad is definitely better than staying at home, twice better. Even the home of the current "Secretary of County Party Committee" is not as good as a home abroad, not to mention their parent’s home. We raised the baby just for salary,” said Li Qianhua. Windy has been worrying that the girl Gu Chenghui she adopted is not a genuine orphan, but an over-quota girl taken away by the government by force. In 2007 Windy took her daughter to Li Qianhua, who once fostered her, to find her own parents, but failed. “If my daughter is actually the outcome of a crime committed by some orphanage personnel, I will do my best to find her original family and share with them my daughter’s life, such as sending photos, contact by mail or arranging my daughter to visit them once a year. This is beneficial to her growth.” Windy wrote this in her email to a Chinese journalist. Besides Windy, many other foreign foster parents of the Chinese children help them to find their “origin in China” through Hu Ying and Ye, etc., Chinese students who study in America. In May 2008 Hu Ying helped an American adoptive mother to post a message on the web to search for the birth parents of her adopted daughter, who was picked up in Yongxi town Zhenyuan county in September 2003. “According to our investigation, it is true that babies who have parents were forced into the orphanage and then abroad,” Tang Jian, leader of Disciplinary Inspection Group of Zhenyuan Administration of Birth Control, was quoted by newspaper. Thank you for giving us the entire story. This is truly heart wrenching. Do you think it's accurate that Chinese parents have no desire to have contact with their children who have been adopted, and simply want to know that they are OK? A lot of factors will play into that, but generally I think that is true. Some parts of this were truly horrific. Thank you for the translation and for posting the whole thing. AS an AP and one who is waiting for a second I am trying to reconcile all of this. Clearly it is wrong for the authorities to take a child for being over quota but how different is that to parents giving up an over-quota child because they fear the authorities? As an AP you have to know in your heart that you are part of the solution and not part of the problem. I guess that is the distinction between the two. The authorities seize children because they know they can be adopted (part of the problem). Parents abandon children out of desperation (part of the solution). Maybe someone else can help me make sense of all of this. I think this is a problem inherent in the one child policy and China's cultural desire for boys to carry on the family name. It sounds like this will continue to be a problem with or without the existence of international adoption in China. The question for me - is whether or not I want to be involved in this process as an AP at all. There are of course, two sides to every story. There is always the angle where children from poorer nations are forced/abducted into adoption agencies and then sold to families in western nations. Let's face it, adoption is an extremely profitable business, especially countries such as China and India. I think this article touched one thing which you don't hear too often: The Chinese One Child policy. Again, here I see both positive and negative factors. One thing for sure though, is that most likely the children adopted to the foreign parents will lead a better life. That's of course also the justification of the Adopting parents to adopt even if they are aware of the circumstances how their adopted children came to be. Ultimately I am not sure who is right but I can only hope that most adoptions end up with happy people on both sides. One thing I can hope for is that the whole adoption business to be made into non-profit. This would lower the cost of adoptions and take away incentives for rogue agencies to force/abduct children. Thank you so much for all you do for the adoption community. I know that as an adoptive parent, it can be difficult to accept all the "irregularities" going on, in all the various provinces, but I truly appreciate your honest reporting. Over the years, I have not always agreed with you, but as I read you more and more, I know you do not hide from what you believe to be the truth. I found it quite interesting that when this story was initially exploding all over the internet, some other "well-known" China adoption experts, were very silent about the story. That spoke volumes to me. This example while damming and a stain on the IA community, is the tip of the iceberg of much bigger issues. The corruption shown by the local authorities working under marginal oversight by the CCAA is appalling......I hate to think about the unlucky percentage of the total number of "abandoned" children - In the past you have stated that a very small number of the "abandoned" children actually are placed for IA - that are absorbed into to the community with no CCAA oversight by morally corrupt individuals. We could stop all IA tomorrow and not make dent in the disheartening realities of many “abandoned “children. At least we can justify to ourselves that our IA children will have opprotunity and a good life. Is it a natural instinct to begin the justification process when one begins to recognize serious corruption in adoption programs? The China adoption community has successfully graduated from total denial to justifying horrific crimes. There is a looming sense that many people that know there are serious problems are now accepting it for what it is and somehow convincing themselves that still adoptees were better off even if trafficked. The community has tackled some tough issues such as the I600 situation, citizenship, the new movie "orphan" and unlimited other "causes". Why is it we become so passive with the issue of trafficking? The one serious issue that demands lobbying and a call to action and the China adoption community falls silent! Incredible. Truly horrific. At least the children that get adopted will be removed from such a vile system. It is just a part of life in China. The corruption, the absolute lack of empathy, and the almost unbelievable cruelty bred by base greed are just accepted as the norm. Get the poor children out of that horrific place. China is a mess. These children have been taken from their parents because they have defaulted on a fine. Think about it. That's it. Unable to pay the fine - bye bye baby. Would you support that in your country? I guess I shouldn't be surprised. The "eyes wide shut" "anything for adoption attitude" pervades so many adoption forums. I just hadn't seen it here. Go to adoption forums - step away from the comfortable adoptive parents discussions and read the words of those who have been told that "at least you're better off." What I don't understand is that China could end so much of this with the stroke of a pen. Either eliminate the "donation" or make it payable to CCAA and not the orphanage and many of these scandals would disappear from IA immediately. The domestic black market may still exist but that's no reason to allow the on-going corruption affecting IA. As an AP who adopted dd just a week or so before the Hunan Scandal broke in Nov. 05, I was shocked when I got to China and found out that the "stories" we were told were not necessarily true - ie where my dd was from and how she came to be "abandoned" or in the orphanage. By the time I heard this information from our agency in country staff, our dd was adopted. It did however, make me really uncomfortable about what was really going on. Then through the intervening years, I have found that these things I was told were in fact true and verify the information that Brian is putting forth. "It is just a part of life in China. The corruption, the absolute lack of empathy, and the almost unbelievable cruelty bred by base greed are just accepted as the norm." Anonymous, and you adopted from China? What do you tell your kid about China? I'm an adult adoptee, and it's not a stroll in the park in springtime. But am I "better off"? Well, having tracked down my birth mother and received a cold shoulder I have to assume that yes, I am better off being adopted by a "respectable" married couple than being a "Love Child"-afraid, ashamed, misunderstood, (you boomers recognize the Motown song Love Child, right?). I would have been shuttled from relative to relative, or raised by resentful grandparents, or an even more resentful single mother whose chance to marry would have been dramatically reduced back in that day so long ago.